Few Americans think about the cost of giving bureaucrats more power and trust than to the citizenry. But the cost goes beyond mere inconvenience. It destroys liberty. You don’t need to look any further than the steady erosion of the rule of law that should govern the federal regulators, inspectors, enforcers and tax collectors. The due process clause has been largely swept aside in citizens’ dealings with such state officials. While courts have created new due process rights for welfare recipients, disruptive school children, even criminal defendants, the rights of farmers, homeowners, parents and businessmen have been shredded. The chief force in this change has been the courts. The federal judiciary has created an overwhelming presumption in the legality of the actions of federal agencies, thus sanctioning many acts by government officials that once would have been considered outrageous, illegal or unconstitutional. Government officials are supposedly so far superior to private citizens, they must be allowed to make up the rules as they go along – or to even change them retroactively. This is the hallmark of federal environmental policy – such as Superfund’s routine ruining of companies and individuals for legal actions committed decades earlier. Arbitrary power converts government employees into a ruling class. Arbitrary power has become more fashionable as government itself has been exalted. It is symptomatic of the contemporary attitude toward government that the term ”czar” now has a positive connotation – be it a ”drug czar,’‘ ”AIDS czar,” ”health-care czar” or ”energy czar.” Americans of earlier generations would be as shocked by the current adulatory use of the term ”czar” as contemporary Americans should be shocked of the use of ”fuhrer” as a compliment for a political leader. Arbitrary power is the epitome of welfare state fairness. But this ”fairness” vests in some individuals the power to coerce, subjugate, reward and punish other citizens, according to their own whim. The only way that pervasive arbitrary power can be assumed to automatically improve society is to presume that the people who wield that power are vastly morally superior to the victims of that power. During the Spanish inquisition, the central Inquisitorial authority could interfere with and ban any sentence or word in any book. A great number of administrators and censors were necessary for imposing such controls, and the person being censored was forced to pay the cost. Charles Lea noted in his classic History of the Inquisition in Spain: ”The powers granted to the revisors gave so large an opportunity for oppression and extortion that the position was eagerly sought for.’ Those bureaucrats had economic and career incentives to steal and plunder in the name of goodness and religion. Paternalism creates a vicious cycle: the more power government acquires to control people, the more citizen naturally fear the government. Not surprisingly, citizen distrust of Washington has risen with each new assault on people’s rights by Congress and the bureaucracy. 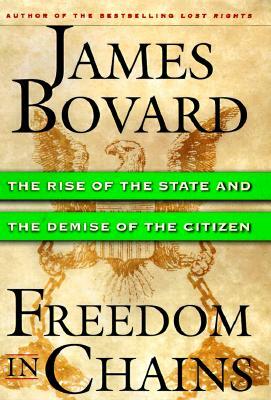 James Bovard is the author of ”Freedom in Chains: The Rise of the State & the Demise of the Citizen” (St. Martin’s Press, 1999).